There will be no train service to three Gold Line stations — Memorial Park, Lake and Allen — from 7.a.m. to 5 p.m. on Saturday, March 23 due to scheduled maintenance. 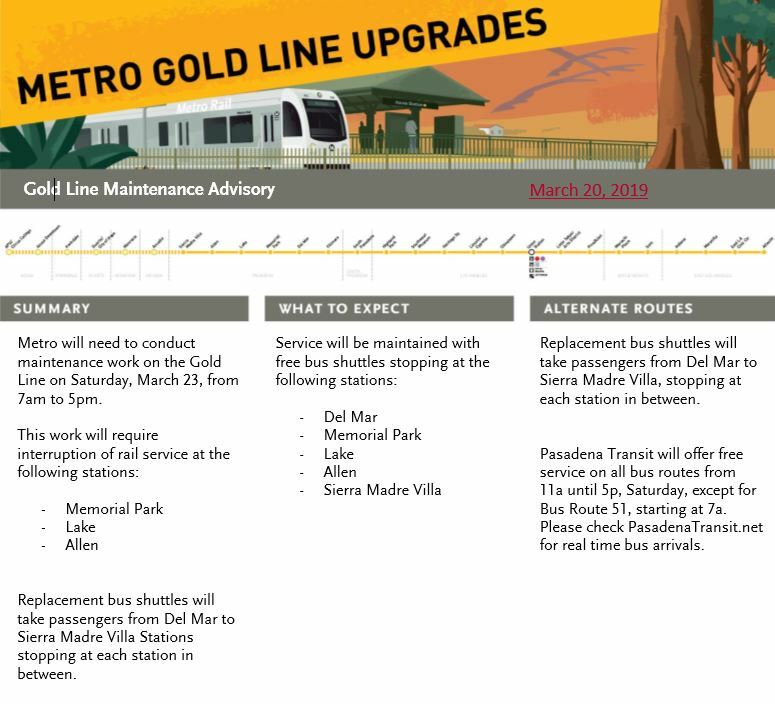 Buses will replace train service between Del Mar and Sierra Madre Villa Stations while the work is performed. This means all southbound trains will travel as far as Allen Station and return to APU/Citrus. The last stop for all northbound trains will be Del Mar Station. From there, trains will turn back towards Union Station. Gold Line service is slated to run every 12 minutes and buses will match the train schedules as best as possible. For alternate service, Pasadena Transit will offer free rides on all routes between 11 a.m. and 5 p.m.
To anyone that may be affected by the work this weekend: Thank you for your patience as we improve the Gold Line! For the latest service updates, please check our Twitter @metrolaalerts.